Being the Crow Family Man is a tough job. 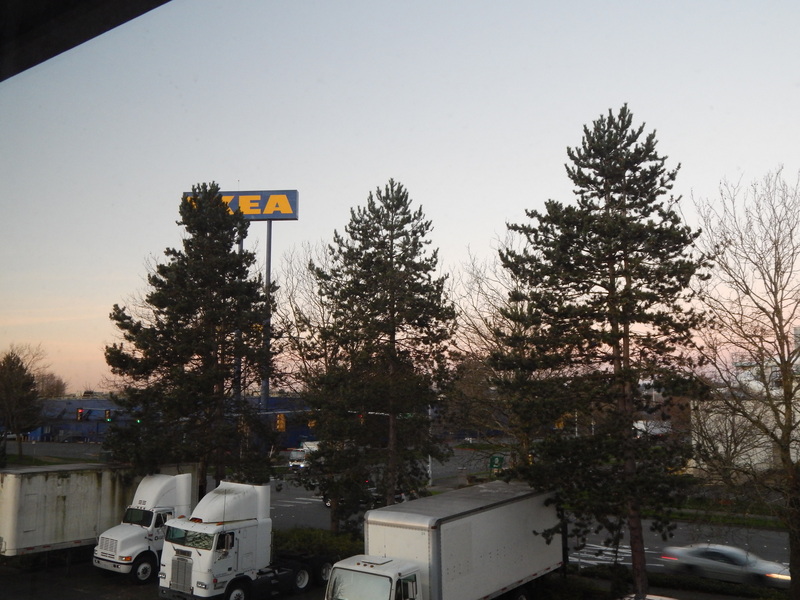 It is spring in Renton and it seems to be coming earlier than usual. It is show time for our annual try at raising a family. 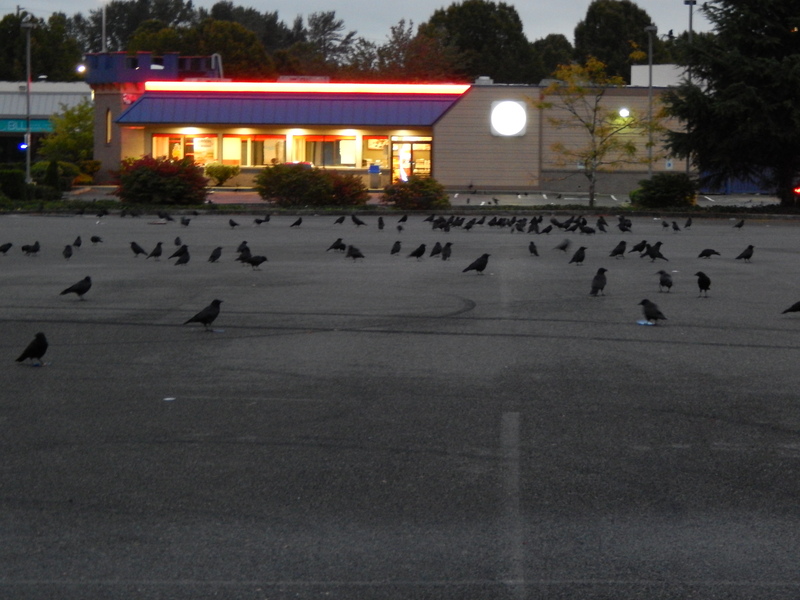 Each day we awake in the big roost down here in the valley south of the town of Renton. The night before we flew over to join the shenanigans at dusk. Then all together we go find our favorite trees for a group sleep. When the sun just begins to bring light into the branches, we stretch and fly out of the trees. Our home territory isn’t far from the main roost, so we just bop over to it. 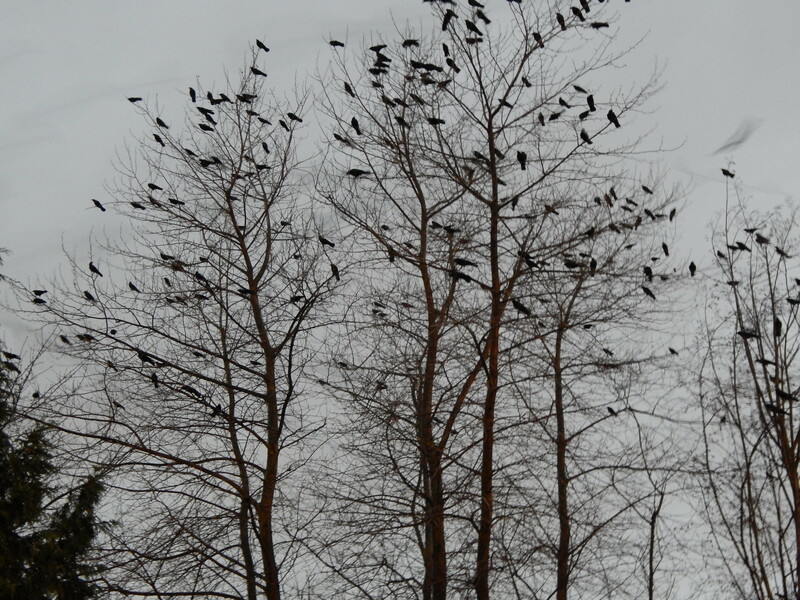 This place we have staked out as ours has good accommodations for us crows. It is close to a food source, it has lots of evergreen trees for our nest, there are other trees with sticks and branches for building and good guard roosts. Food is important for raising a family. 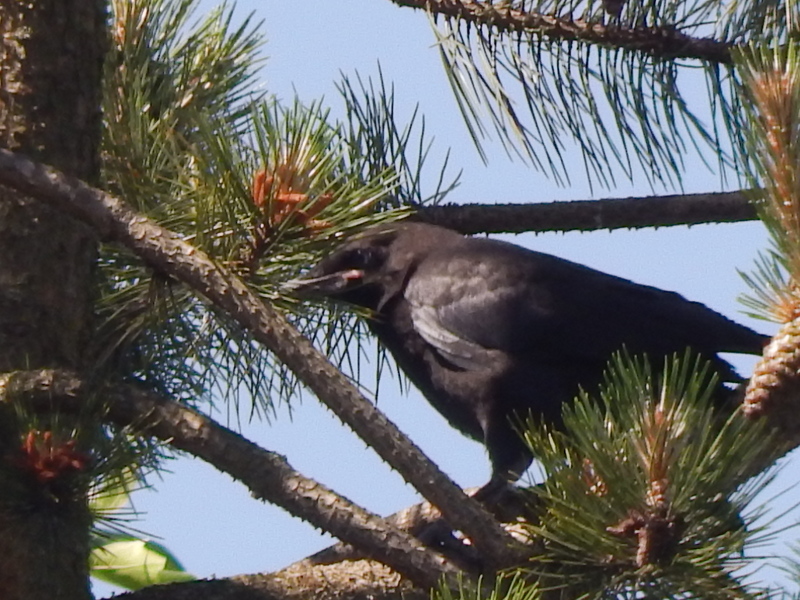 We crows will eat just about anything but baby crows need a protein rich diet. This home of ours has both natural and man-made food sources. Off to the northeast of us is a small marshy pond. There we find bugs and grasses to gather for the kids. Our area is a major intersection for the humans. This can give us the bounty of road kill and other food items thrown by humans from their cars. Off to the east of our spot is a place called Burger King. 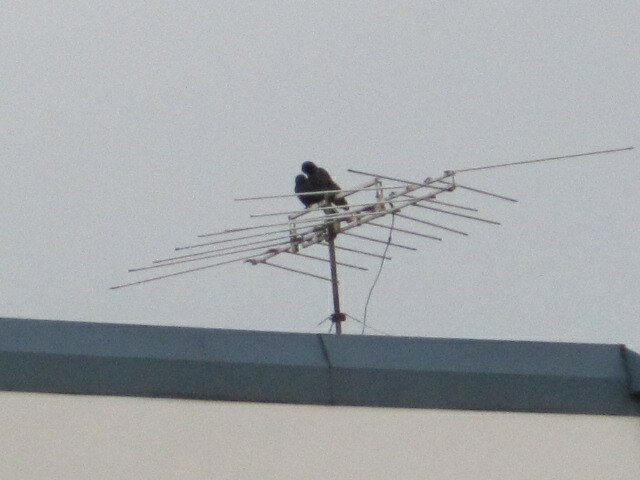 We don’t claim that as ours because it is too popular for other crows. The fighting to keep it to ourselves isn’t worth the risk. It does have some good eats in the surrounding parking lot from humans throwing out trash and the always full garbage cans. You could say we have a pretty stable food supply. The right tree for the nursery is very important. We prefer evergreen trees because of their dense foliage and sturdy branches to build upon. In this case we have a good selection of pine trees. Several nests have been successful in this row of trees. Sadly, we have lost a couple of babies in them too. That was when my wife and I first started out. We weren’t very experienced and over the last couple years have learned a lot the hard way. Is this a good one honey? These good nesting trees have many maple trees near by. This is just as important for several reasons. 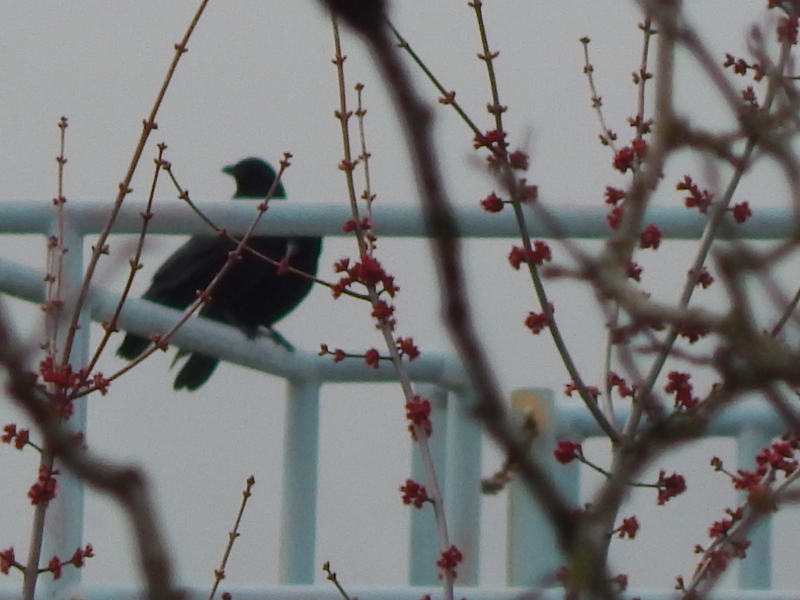 They provide good sticks and branches for nest-building in the early spring when we assemble our new home. These small branches we can easily break off with our beaks. They also shed a lot of good nest material that we can forage from the ground. When the babies fledge these trees provide a protected play area where they learn to fly. Broken Pine with building material Maples. Pine & Maple trees make a good play ground. Lastly, we have good roosts to watch the nest area either visible to all or secretly tucked away from prying eyes. This includes light posts, traffic light arm standards, a big IKEA sign, buildings, an antenna (that does not work anymore) on top of our adopted company’s building, and across the street a bunch of pipes, vents and a man railing. Me and my girl each morning have been investigating the trees trying to decide which one we want to make home. Perhaps we will reveal that to our human friends, so you can watch us raise this year’s set of baby crows.